The most disappointing (and the most expensive) were solar lamps and lamp posts produced by traditional light manufacturers. The selection and quality of light just wasn’t there. Find out why! While traditional lighting firms continue to move into outdoor solar lights, the quality usually is no where close to solar lighting made by companies that have specialized in primarily or exclusive in solar lights for decades. Making bright, reliable and long-lasting solar lights is a bit more complex than switching electric power out with a solar panel and rechargeable battery. Good systems provide long-lasting light; others provide light that lasts a short time or is reliable only on very sunny days. Some companies have been designing these systems for years and have the best solar lighting engineers in the world working for them. Other manufacturers are starting from scratch to develop new solar fixtures. And even with the best designers and engineers, a lot of unique technology has been patented. What the experts have been doing often can’t be copied. So, it’s no surprise that the reliability or expected hours of light from bad solar lighting companies and even exception traditional lighting engineers still lags behind the best solar lighting manufacturers. For solar lamps, the chart below tells part of the story. Our YouTube Video goes over some of the options available in quality solar lamps in terms of styles, mounting options and other special features. 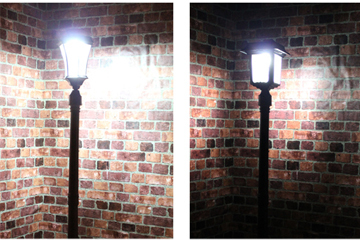 It review some new “Intelligent Lighting” technologies used in some new solar lamps and tries to explain why LEDs alone don’t mean quality illumination. The systems to control how the LEDs, batteries and solar panels vary from manufacturer to manufacturer. Some are better than others. The nature of LEDs complicates solar lighting. We see far too many LED fixtures (solar, electric or battery-operated) that aren’t very bright. The same goes for many LED bulbs designed for traditional sockets. Our biggest problem with most of the lights, but particularly most solar lamps and a good number of flood lights and spotlights) was that the illumination wasn’t very bright and when it was, it often didn’t cast very far away. LEDs, as we’ve said in past posts, may be the best LEDs in the world. Super Bright LEDs? 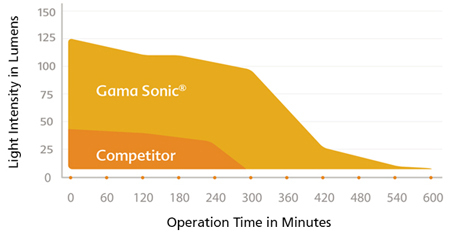 You will be seeing that term used less often by better lighting manufacturers. It’s been overused and frankly doesn’t mean that much any more. An LEDs’ brightness only means something if it sheds well to casts illumination over a wide area. LEDs need help so that their laser-like beams become meaningful illumination. This entry was posted in Online Shopping Tips, Selecting & Caring for Solar Products and tagged features of quality solar lighting, how to buy good solar lights, how to buy solar lamps, outdoor solar lights, quality solar lights, solar lamp post, solar lamps by SolarLightingSmart. Bookmark the permalink.